Have £40 or so in your pocket and camp outside one of many stores (Dixons/Currys/PCworld are one set of outlets, Argos probably another) for 9am Wednesday, and you should be able to walk out minutes later with a Google Chromecast. 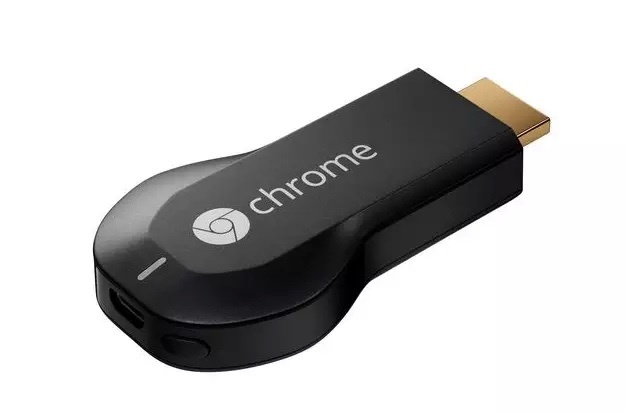 Having used my US-sourced one for 8 months now, i’ll provide a short list of things to do below, to ensure you have your Chromecast working straight away – and without the speed bumps that new users typically experience. I’ve been running mine since they first got released in the USA, and fortunately managed to get one of my relatives in Arizona to redirect the two I ordered on Amazon to here. My youngest son in North London has the other one. Once set up, you can fire up YouTube, Netflix, Google Music or a Chrome Browser Tab on your iPhone, Android phone, Apple iPad, Android Tablet or on a Windows PC – then literally throw the display over to your large flat screen TV. After doing so, the source device becomes the remote. It is fantastically impressive. I managed to throw a YouTube video of Marc Bolan and T-Rex (my wifes teenage crush way back then) playing on YouTube to our Toshiba 37″ TV, then piled a set of his other tracks in the queue behind it – which then played one after the other. Ditto for streaming Google Play Music, having built a playlist of Christmas Music tracks to play in the background at a Family Christmas get-together. For me – living as we do 3 miles from the local BT exchange and having broadband speeds of 1-1.3Mb/s, the most impressive thing to me was having Netflix stream a 2-3 hour film to our 1080p 37″ TV with no loss of quality, no noise and a perfect viewing experience. Last week, the BBC released a maintenance release of iPlayer – but which appears to have Chromecast support hidden inside and ready to go. If SkyGo does likewise, then I believe all our media needs will have been met. On your home Wi-Fi router, disable “Accesss Point Isolation” – aka “AP Isolation”. If your router was used in a coffee shop, you wouldn’t want other drinkers’ devices able to access your computer, tablet or phone – and hence AP Isolation is normally enabled to insert the Chinese walls. Your Chromecast needs to be able to talk to your phone/tablet/PC via the router, so this must be disabled. Note that some Asus branded routers don’t allow you to do this; those would need to be replaced. Note also that if you have a BT HomeHub router, they already have “AP Isolation” disabled for your private, home network – so no action is needed if you connect your Chromecast to that; as long as you don’t use the BTfon/BTopenzone/Public network in place in some units for your Chromecast connection, you’re in good shape already. Your router needs to be using the 2.4GHz WiFi band using 802.11B, G or N speeds; that is the usual norm, and virtually every router works on these. However, some routers – particularly ones that daisy chain together to provide wider geographic coverage – can use 5 Ghz signal frequencies as well. The Chromecast cannot use the 5GHz bands. Note also the 2.4GHz is normally good for indoor use only; be aware that 2.4GHz is the frequency at which a Microwave disturbs/heats water, hence why WiFi routers aren’t so good if there is rain between the router and the devices wirelessly connected to it. The Chromecast plugs into one of your TV HDMI ports. The power cable on the back of it plugs into a spare USB port on your TV (if a powered USB port is present – Chromecast just needs the 5V provided) or use the power supply provided to plug it into a mains socket. Even the USA one we received worked on a 240V supply without any adjustment. Install the Chromecast app from the Google Play Store (for Android), AppStore for iOS or where directed for Windows/Chrome. You only need this on one device to set the unit up, from which point the application is rarely used again. Set the HDMI channel on your TV as the signal source using your TV remote. Some on screen installation directions should be present. Fire up the app, follow the instructions (we named our TV “Living Room”). Once all set, the TV screen will show a message saying “Ready to Cast”, and with a screen saver background that keeps changing every few minutes. Then, time for fun. Fire up the YouTube app, Netflix app, etc on your phone, tablet or PC. Start something running (my introductory pick was YouTube with Laurel and Hardy in “Way Out West” – singing “The Trail of the Lonesome Pine”). Then select the “Cast” icon, choose the name of your TV listed, and then sit back. The stream feeds into the Chromecast, and your TV fires up the video/sound of your chosen video or film. From that point, your local device becomes the remote control – so you can pause/play/stop at will. That’s all there is to it. Hope you enjoy this device as much as we do – and please tell our your friends! And if you’ve any issues with yours i’ve not listed, reply below and i’ll endeavour to assist. The part number Google assigned to the Chromecast I have is “H2G2-42”, which is a tip of the hat to “HitchHikers Guide to the Galaxy” and 42 – the meaning of Life, the Universe and Everything” from the novel by Douglas Adams. The associated power supply (at least in the USA) is MST3K-US. That in turn is a tip of the hat to “Mystery Science Theatre 3000“, a cult American Comedy TV series. Another Fantastic Resource on Google+ is from James Mosvick: Chromecast Tips & Tricks Guide.